When driving through Africa you’ll see animals that make the ones we get in New Zealand look tiny – an elephant can dwarf a big SUV, and a giraffe can be over a metre taller than a large truck. 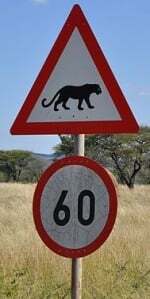 If you’re heading to Africa on holiday and expect to do some driving, here are signs that you might see on some of the roads. These animals can be particularly dangerous for motorcyclists, too. With hippos responsible for over 2900 deaths per year, they are one of the most dangerous of African animals. If you see this sign, take care as there may be hippos nearby. If you hit a giraffe on the road your vehicle is likely to take its legs out from under it and the body (which can weigh over 1300kg) will fall onto your vehicle, which could cause serious injuries. Hyenas are scavengers and predators. The size of a medium-sized dog. They may be feasting on road kill, or sometimes cross roads at crossing points. If you hit and injure a hyena, don’t stop to check if it is OK as an injured animal can be dangerous. And, as hyenas travel in packs, there will be others around. Large deer, kudus and similar antelope-type creatures are common in some areas. They can be startled easily and dart into the path of your vehicle. Many of them have sizable horns which, if they come through your windscreen, can cause injuries. Elephants are the largest animals you’ll see on the roads and they can be in forested or savanna areas. It’s rare for an elephant to charge at a vehicle, however, they are known for standing their ground and you will have to wait until they move. If a family is crossing the road, you might be waiting several minutes. If an elephant stands you down, reverse slowly back up the road. Dung beetles roll balls of dung and will sometimes cross roads to do it. They’re an important part of the ecosystem so try to avoid running them over. Africa has a number of varieties of cow that are bred domestically. They will be roaming and are unlikely to be fenced. Horses and riders will be found mostly nearer urban areas – who would want to be riding a horse in lion territory! Leopards are found in some savanna areas. They blend very well with the surrounding vegetation and are extremely difficult to see. Oryx are antelopes with long straight horns found in East Africa. Ostriches are the largest living species of bird. Rhinos are short-sighted and can act defensively even around vehicles. Check out this one attacking a Land Rover. It left a substantial hole in the panel. Domestic sheep are raised in areas of Africa. They may not be fenced so could be wandering on the road. Tortoises may be crossing the road in some areas. As they are slow-moving, be prepared to stop. Vultures are large birds and feed on carrion, therefore any type of roadkill is fair game. They don’t take off quickly, so be prepared to slow down to give them time to move off any roadkill. Warthogs are stocky and can be aggressive if they are protecting young, though not to cars. Usually they will flee, but they are difficult to see at night because of their dark colour, so be careful driving on roads in the dark. Wild horses can be found in some areas. Zebras are well-camouflaged and are especially difficult to see at dusk and dawn. 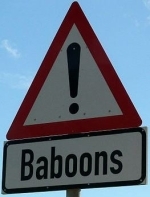 Baboons are inquisitive and can cause damage to your car. They are also dangerous with sharp teeth and strong arms. Keep windows closed. Lions can conceal themselves very easily and will ambush an unwary human. If you are stopping to relieve yourself behind a bush, bear in mind that many eyes will be watching you.